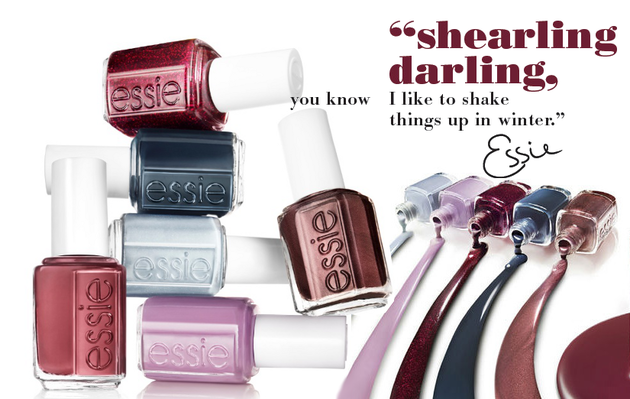 Essie’s latest winter collection, ‘Shearling, darling’, has finally hit the shelves. Mind Your Mittens, Parka Perfect and Sable Collar*. Mind Your Mittens is a dark teal blue that really flattered my cool (read: uber pale) skin tone. Parka Perfect is a creamy egg shell blue that’s actually a little paler than what it looks like in the picture. I was impressed with how, despite being a light cream, it didn’t streak in the least. My favourite of all the hues, however, was Sable Collar, a metallic browny eggplant shade. (That’s the best way I can think of describing it!) This came as a surprise as I’m usually not a fan of metallics but this one looks really modern and classy; like a satin negligee. When winter rolls in, I kind of get stuck in a red polish rut, but playing with these other shades was fun and I’ll definitely be wearing Mind Your Mittens and Sable Collar once my current rooi gelish mani grows out. Which of these three are your favourite? *Forgive the messy manis, I’m a busy girl, okay? Hands up! Who wants to win a zexy Dune London mini iPad case? I always laugh when you call them “messy manis”. When I paint my own nails it looks like a 4yr old’s art project haha! Yours looks bloody great!